Winter All Area athletes - Frontier wrestling Jacqueline Hernandez. Winter All Area athletes - Golden Valley wrestling Coach of the Year Juan Gamino. Winter All Area athletes - Ridgeview wrestling Genesis Quirarte. Winter All Area athletes - Foothil wrestling Kendra Juarez. Winter All Area athletes - Foothil wrestling Ariana Juarez. Winter All Area athletes - Mira Monte girls wrestling Yazmine Perez. All area - East High wrestling Cindy Pelayo. Winter All Area athletes - Golden Valley wrestling Aliana Lefotu. All Area winter sports - Orianna Morales Bakersfield High wrestler. Winter All Area athletes - Ridgeview wrestling Marian Perez. Winter All Area athletes - Liberty wrestling Kendall Braswell. Winter All Area athletes - Ridgeview wrestling Maliya Castillo. Winter All Area athletes - Golden Valley wrestling Macy Bullard. 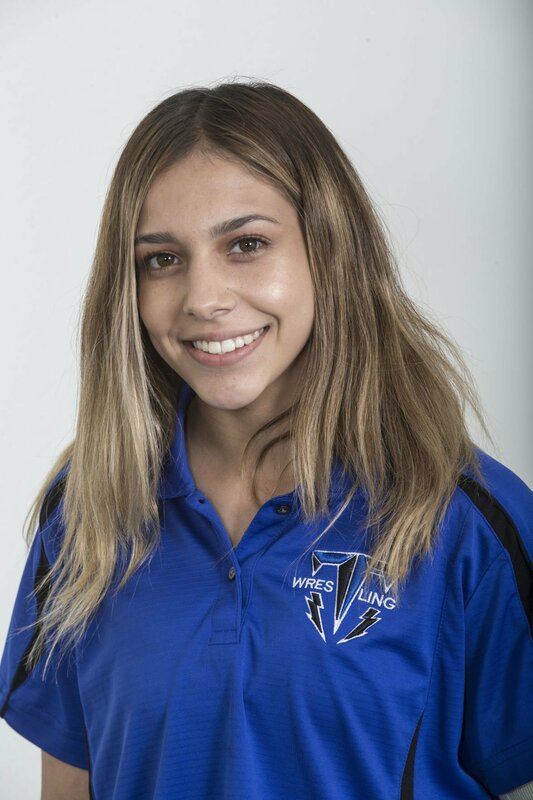 Wrestler of the Year: Shareni Donis, South - The three-time Central Section Masters champion went from becoming the first girls wrestler at South to finishing fourth at the CIF State Championships as a senior. Donis went 46-6 at 150 pounds this season and finishes her four-year career with a 103-19 record on the mat. Jacqueline Hernandez, Frontier, freshman, 101 - Burst on the high school scene with a fourth place finish at Masters and an eighth-place finish at state before injury-defaulting. Genesis Quirarte, Ridgeview, junior, 106 - The two-time Masters champion won the 106 title before placing sixth in state, earning her second state medal in as many years. Kendra Juarez, Foothill, junior, 113 - Finished the season with a 37-11 overall record. Finished third at Area, fourth at Masters and was a first-time state qualifier. Ariana Juarez, Foothill, junior, 116 - The Area and Masters runner-up finished the season with a 38-7 overall record and was a first-time state qualifier. Yazmine Perez, Mira Monte, freshman, 121 - Top finish for a freshman at Masters at 121, finishing third. Qualified for the state championship where she was unable to win a match. Cindy Pelayo, East, senior, 126 - Topped off a fantastic prep career with a 28-3 record, a Masters title and a 3-2 record at state. Was the first All-Area Wrestler of the Year in 2016-17. Aliana Lefotu, Golden Valley, sophomore, 131 - The sophomore finished the season with a 42-12 record, won the Masters championship and finished 2-2 in her appearance at state. Orianna Morales, Bakersfield, sophomore, 137 - The Bakersfield High sophomore just missed out on state with a fifth-place finish at Masters after a second-place finish at Area. Marian Perez, Ridgeview, senior, 143 - The Masters champion advanced to the quarterfinals at state and finished with a 2-2 record at Rabobank Arena. Kendall Braswell, Liberty, freshman, 150 - In her first year in high school the Liberty freshman finished sixth at Masters after a third-place finish at the Area tournament. Ehireme Ohens, Stockdale, sophomore, 160 - After moving to town from the East Bay in the middle of the season, Ohens finished fourth at Masters and medaled in eighth-place at state. Maliya Castillo, Ridgeview, freshman, 170 - Took up the sport to begin the season and finished third at Masters and went 3-2 at state after losing in the opening championship round. Kayvette Osorio, Golden Valley, senior, 189 - The senior capped off a fantastic career with a third Masters title. She went 2-2 in her fourth state appearance and held a 41-10 overall record this year. Macy Bullard, Golden Valley, senior, 235 - After finishing third at Masters at heavyweight, the senior’s season ended with an 0-2 finish at state. Had a 26-11 record.